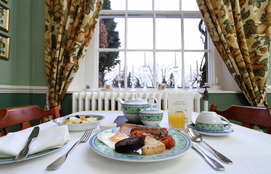 Our rates include bed and breakfast so we look forward to welcoming you for a delicious home cooked 'Yorkshire breakfast', most of which has travelled less than 5 miles from field to plate. All guests are welcome to cereals, mixed fruit, yoghurt, toast, preserves and any or all items from the cooked breakfast. We are working on expanding the 'breakfast special' options as an alternative, so if there's anything you'd like to see, let us know! Similarly, we want to make our vegetarian / vegan guests feel well catered for, so if you know of some excellent meat or dairy-free alternatives or just great recipes then Natalie will be keen to hear about them. As Bank Villa is perfectly situated to enjoy all that nature has to offer, many of our guests plan to walk, hike, cycle or visit outdoor attractions during their stay. If you'd like a traditional picnic or packed lunch preparing for your day out, get in touch to discuss what's available or discuss it with Natalie during your stay.